*I know, I know - on one hand, this seems like a pretty weak post. But know that I have really enjoyed reading other people's Shuffle lists - and would love to read yours! This weekend, it is time to Spring Forward. Ugh. I really hate "giving up" that hour. And when you think about it - this weekend has all the un-fun events: April Fool's Day and Spring Forward. Hardly seems fair. Can you tell I've been doing my Baltimore research??? To make up for the lack of content about either my life, or something crafty - let me share what I'm reading. Or - more accurately - what I just finished reading: Busting Vega$: the MIT Whiz Kid Who Brought the Casinos to Their Knees by Ben Mezrich. This is a somewhat familiar territory for Mezrich, who a few years back wrote Bringing Down the House, which was about a group of six MIT kids who took Vegas for millions. See the subtle distinction??? To be fair, Mezrich himself points out that at first he was not interested in this story. Another MIT kid with a tale about beating Vegas? - he'd been there, done that. But the Russian whiz kid of the title convinced him that it was a completely different story. I never did do my lesson plans! Hee! * It was a lovely thoughtful gesture. * the "tea" itself was a thing to behold: three kinds of tea, three different finger sammiches, scones, and cookies and tarts to numerous to recount. * And of course, my slackerdom did not come to light, since we were forbidden from talking shop. It looked like the only downside was that we were all required to wear hats. Big goofy hats, so as to "put us in the proper frame of mind". But I scrounged around in the big box o' hats and found......a TIARA!!!!!! Never have I been so positively reinforced for completely blowing off my work. A smart and appreciative girl would take this opportunity to sit right down and complete a month's worth of beautiful, eloquent lesson plans. But not me! Spring Break starts Friday, thereby allowing me to postpone the inevitable even longer. but we had some pretty amazing looking fog this morning. 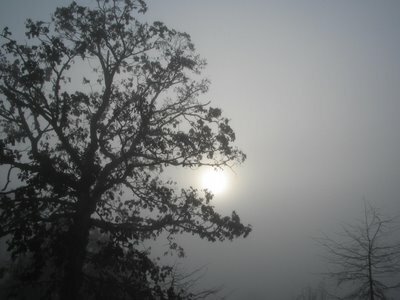 The sun seemed very low in the sky and quite large, and it was truly difficult to see where you were going. Schecky and I pretended we were spies as we walked into school... I took this picture at about 7:30 am. *and to add insult to injury, not only are other parts of the world getting to view a spectacular solar eclipse - lots of them don't even appreciate it! In the AP article that I linked to earlier it states that pregnant women are being advised "not to go outside during the eclipse to avoid having a blind baby". Oh, yeah - and food that you cooked prior to the eclipse? You need to throw that out, because now it is impure. Huge parts of the world are preparing for a total solar eclipse today. Sadly, it's not happening in my part of the world. Sigh. visiting every blog that I have ever bookmarked. visiting every blog that I have ever bookmarked a second time. visiting every blog that I have ever bookmarked a third time. Starting to sense a pattern here? Wouldn't it just be easier to do my lesson plans? One would think so... But none of my "motivating" tricks that I use to convince myself into doing unwanted jobs seem to be working. *I did come across an interesting quiz - Are You A Hit-Obsessed Weblogger? - thanks to the lovely and talented GeekyMom. I was so thrilled to find her blog, as she happens to be my long-lost best friend from Senior Year in high school...hi, LCB! 30 points. TYPE C (HIT-CURIOUS). Fans of Fark.com will likely recognize this fellow. *and that a FAQ for him can be found here. I sneak out, and I go see a movie. By myself. Again, to be honest, there's really no sneaking involved, however - it's even more enjoyable if I can make it seem more clandestine than it really is. What makes this possible is that the local neighborhood artsy-movie house starts showing movies at 11 o'clock on Friday mornings. So, if I pick judiciously I can see a movie and get lunch out before picking the boy up after school. Last Friday was a movie day, and I saw Following Sean which was quite good. It's funny because I don't really advertise my movie Fridays*. It seems so decadent, like I am some sort of spoiled princess - don't I know that there is work to be done? But you know what? - it is one of the best things that I have done for myself in a long, long time. And it makes me so happy. *even though I don't volunteer that I have movie Fridays, if someone asks me if I have seen any movies lately, I will, of course, own up to what I've seen. Funnily enough, I seem to have gathered a reputation for seeing only artsy, independent films - I'm getting a rep as a real "film aficionado". The real truth? The artsy, independent movie house is the only place that starts screening early enough in the day. My real criteria for seeing a movie? It has to to be something that I have at least a tiny interest in - but the biggest factor in what I see is really the start/run time of the film....Some aficionado, hmmm? Ta-da! 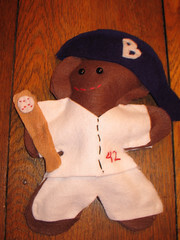 Here is Schecky's completed Jackie Robinson doll. Schecky came home from school this week with a fun, albeit random-seeming assignment. He is to create a doll of a civil rights leader. The school sent home a list from which to choose, and Scheck chose Jackie Robinson. I was actually kind of interested in this assignment, if for no other reason than I have enjoyed getting back to knitting, and creating with my hands. And whereas the boy has been very interested in what I am doing, he has not been interested in me teaching him how. Besides, it seems my worries were for nothing - we have had an absolute blast the past few afternoons: designing Jackie Robinson on paper, making a "pattern" and then making it happen. I am so proud of the Scheckster.... he is so excited about this, and is working so hard on it. The energy, enthusiasm and creativity little kids have is truly a beautiful thing in which to share. We're not done yet, and I'll post the final project when we're through - however, I'd love it if you took a moment to look at our Flickr pictures that we have so far. And did I mention how proud I am???? CAUTION: Unless you knit, or unless you are amused by stories about the cluelessness of some knitters, you will be bored to tears by today's entry. If you continue to read on, don't say I didn't warn you! I decided to get cracking on another of the Jess Hutch bears. I can't help it - they are just so satisfying! They are the perfect knitting snack food: they're quick, they're delicious, and they are so addictive. Jess needs to include the warning, "Bet you can't knit just one...."
Anyway - foolish me, trying to improve upon the perfection that is the "Henry the Bear" pattern. 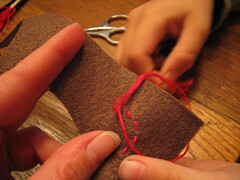 Yet, I attempted to do so... You see, I don't feel like my duplicate stitching is all that great. And intarsia has never bothered me. 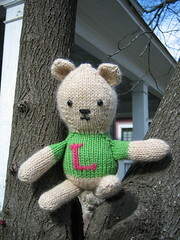 So I decided that when it came time to monogram the bear's sweater, I'd just knit it in. 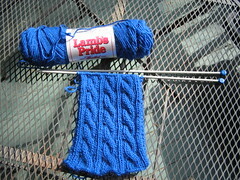 You can't do standard intarsia knitting (a method of knitting with multiple colors) in the round... The easiest solution is to just work an object flat and seam it if it's an intarsia project. So I rolled my eyes at myself, and frogged the previous row, and it's all good. Thanks for the lovely comments and emails, they were a day-brightener! Well - I never have managed to get my sleep schedule back into shape, and I think that it has caught up with me. With a vengeance. I'm going to bed at a decent hour. Some might even say really early. Then I'm sleeping horribly and fitfully. And then somewhere between 3 and 4 in the morning, I am just up. That's it. That's all she wrote. I am up. This morning I finally gave up and got out of bed around 4. And I realized that I just felt....well, for want of a better word - cruddy. I've got a headache from hell, my nose is runny, I'm achey, my tummy hurts, blah blah blah. I've got such a random grab bag of symptoms that I am not sure if I am really sick, or if I am just fatigued beyond belief - but there it is. So - I'm going to embrace this. Hey, if you can't beat it, join it - right? read a little - I think Amazon is sending some stuff my way! watch the two episodes of Related that TiVo got for me last night. (this will be bittersweet - I really like this show, but it would appear that I am the only person on the planet that has ever watched an episode. I'm not saying it is the greatest TV ever, but it is a pleasant little show with good dialogue and I like it. Anyway, I suspect that the "Season Finale" that is awaiting me is actually the "Series Finale" and that it will disappear without a goodbye - just like last year's Jack and Bobby, another nice enough little WB show that no one but me watched. I have somehow managed to get my sleep schedule all out of whack, and I am paying for it today. I've been going to sleep earlier and earlier lately, until last night I think I was out by 7:30. Do I know how to live large on a Saturday, or what? But then, I slept very fitfully, with very petty and stressful dreams. Ugh. Around 3, I just decided to give it up and get out of bed. I've been doing some Flickr wandering - just roaming about and tag surfing to see what there is to see. Yesterday was a day for running errands, and -- are you sitting down??? -- yardwork! Bubba decided that we should tackle the backyard, so he mowed down pretty much everything* there was to mow down (no easy task). *He did spare the mutant mystery daffodils, however! 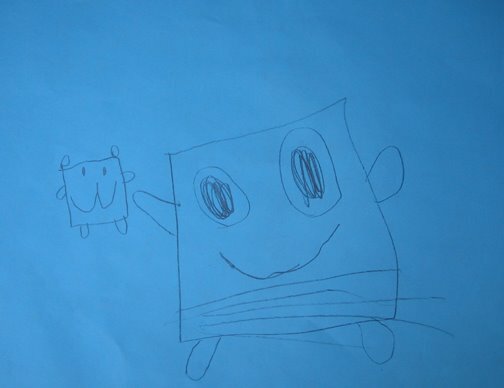 On Wednesday, Schecky asked me if I would make his Squarey a bear of his very own. I replied that I'd love to, but how should a little bear look? 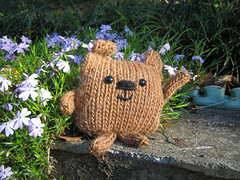 So, introducing Beary, Squarey's small square ursine friend. Don't they look so happy together? I am pleased because I worked without a pattern, and managed to create something that vaguely looks the way I wanted it to. I'm not completely happy with the ears, and his legs should have been placed more toward the corners of his body.....but Schecky is thrilled, and assures me that Squarey is too. You are very easygoing and sweet. People like to keep you close because you are so softhearted. You love to be comfortable and warm from your head to your toes. I don't think I've laughed so hard since...well, yesterday, at the thought that people seeking fashion advice were inadvertently coming to me. Easygoing and sweet? I wish! I am as Type-A as the day is long, and I suspect my heart is an evil little cinder. I am every bit as snide as the girls on GoFugYourself - although I try to keep quiet about it, because whereas they are clever and snide, I'm, well....just snide. * I need to figure out how to create that blogroll list along the side of my blog template, so that I can share some of my favorite people with you! This morning, some lovely, lovely British citizen typed into the GoogleUK search engine Do stripes make you look fat - and up popped BFC! And when I test it here with Google.com, it works, too! All thanks to the charming BabyChubbins. Who is, as I type, in a box on his way to Florida. Just think - all over the world fashion-concerned young men and women could be consulting their search engines on a quest for flattering fit tips, and they will be directed to my little site o' bears, knitting and other day-to-day minutia! This just cracks me up, as to say that I am severely fashion-impaired is the understatement of the century. This has, oddly, made my day. Although I did go to the dentist this morning, and got a good report card. Appearantly, I have "amazing gums". Just what a girl needs to hear from time to time. ...and now you know how I spent the remainder of the weekend, once I got the in-laws all packed up and out. This is Laurie - whom I made for a woman who works at the preschool. She (the preschool girl, not Laurie-the-bear) is a real, true crafty girl and I hope that she'll overlook any mistakes that I made! Actually, that's really just me being hypercritical - she is not judgmental like that at all....Also, this is the best bear I've turned out to date, although I will always have a soft spot for BabyHenry, since he was my first born. Miss Laurie's arms look a little wonky in this picture, since I kind of had to wedge her into the crook of the tree. She's much more graceful in person. 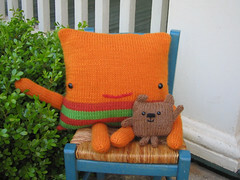 I am still having fun making bears, which is good, since I figure I've got at least 5 and perhaps more to go! 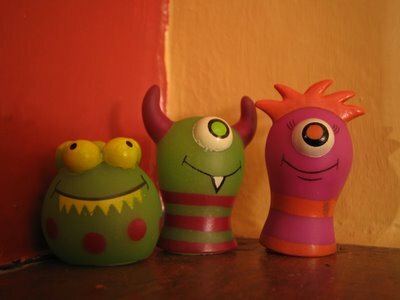 It is funny how each one seems to have a different personality and turns out quite differently. 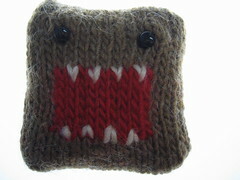 I am thinking about modifying the pattern somewhat and attempting to knit a zombie. If I get that started in the immediate future, I'll keep you apprised. Aside from finishing this little one, not too much new on the home front. It was a nice visit with the in-laws, the weather is gorgeous, and life overall is good... 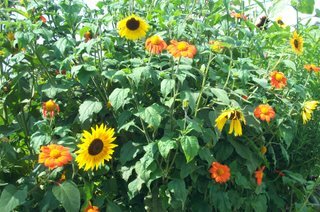 It's not much to blog about, but it sure is pleasant. Just got news that my in-laws are coming tomorrow and spending the night. However, this was the first photo that I ever posted up on Flickr, and I have always liked it a great deal. 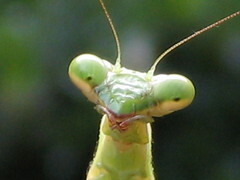 It was also the first time I used the "macro" setting on my camera.... I am smitten by the macro setting on my camera. You know, for someone who bills herself as a voracious reader, and for someone who loves to read (and I really, really love to read) I've not been doing a great deal of it lately. Or I've still been doing it, it's just not making me as happy as is usually does. Except for the aforementioned Owly. I seem to have hit a rough patch - which happens occasionally. Nothing seems to really fit the bill, nothing really grips me, or is enjoyable enough that I feel the need to pass it on. In the past few weeks, I've mired through some best seller stuff - legal thrillers, the new Jody Picoult, etc. - and while none of it was great, none of it was terrible. Except for the latest Baldacci, The Camel Club which I thought was a big clunker. I've had a bunch of books come in that I was very excited about at the time that I put them on reserve at the library, but can't seem to muster up the enthusiasm for now that they are here. I've got Sophie's Choice, which I am having a devil of a time getting into. (I'd never read it, and it just seemed like I should.) I've got this amazing biography of William Faulkner that I had to wait to get for something like 3 months. Now that's it's here, I just can't muster up the strength to dive in. I feel somewhat guilty - I keep wanting to mutter to these neglected books "It's not you, it's me!" My beloved Bubba is the Lord of the comic book guys. I know, I know...but he was like this when I married him, so it's not like I didn't know what I was getting into. He gives me no grief about my reading habits, I don't give him grief about his. But once Schecky was born, Bubba was determined that he would become "Son of Comic Book Guy". Which I don't have much of a problem with - my parents didn't care what I read, as long as I was reading. I kind of feel the same way with Scheck. Plus, Schecky desperately wants to be "Son of Comic Book Guy". However, most comics really aren't for little kids - too violent, and the women...well, don't even get me started on the parody of feminine archetypes! 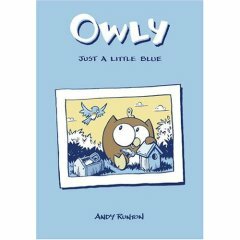 Therefore I was delighted to find Andy Runton's Owly. I love everything about this guy - he and his best friend, Wormy are such lovely and subtle role models. They have non-sappy, yet non-scary adventures and life lessons. And the artwork just rocks. The stories are told entirely through pictures, so even the youngest child can "read" along - yet the stories are engrossing enough, and the characters so beautifully expressive that even the grownups can't wait to see what is going to happen. Plus, I think that Andy Runton is an Atlanta boy, so you can feel good about that too! *The first book in the series is called The Way Home & The Bittersweet Summer, I just couldn't find a good sized graphic for it. But it is wonderful, too! It's actually a vicious cycle - we never go in the backyard because it is such an untamed wilderness, but it's a untamed wilderness simply because we never go out there. Also, we never go out there because in Georgia, mosquitos grow to the be size of wombats. And they manage to live pretty much year round, it seems. But I digress - I decide to go investigate the mysterious color flash. The back door was a challenge, since it hasn't been opened in months. Once that hurtle was cleared however, I fought my way through the brush and discovered daffodils! 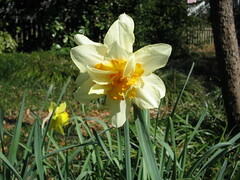 They are kind of mutant daffodils - check out the ruffly centers and the sticky-outy things - but daffodils nonetheless. Which is weird, because I don't think we used to have daffodils. * I know I didn't plant daffodils. And I don't think they are one of those plants that just spontaneously shows up. Well, BabyHenry's limbed cousin is complete, and has turned out to have quite a different personality. He's much more happy go-lucky, and somewhat more fearless. There are a few more picture of Chubbins at Flickr. 3. 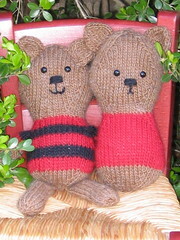 Both Henry and Chubbins were made with Brown Sheep Lamb's Pride in Wild Oak, Ruby Red, and Onyx, from a pattern by Jess Hutch. *Just between you and me, doesn't he look weird with arms and legs? I am so used to Henry, that all those limbs protruding out everywhichway are going to take some getting used to! The limbs on the right belong to BabyHenry's chubby cousin, and should be attached today. The leftmost limbs are to get the jump on a little oatmeal colored beauty who will be up next. I envision her with a whole prep-school thing going on...pink and green sweater and all. I've joined my first Knit Along - this great little Irish Hiking Scarf, a free pattern from Hello Yarn. It's been a long time (high school, maybe? So a REALLY long time) since I did any cable knitting. I was quite relieved to find that it comes back rather quickly. And this is a pretty quick little knit - what you see pictured here was done last night during the Gilmore Girls, and 2 episodes of Scrubs.